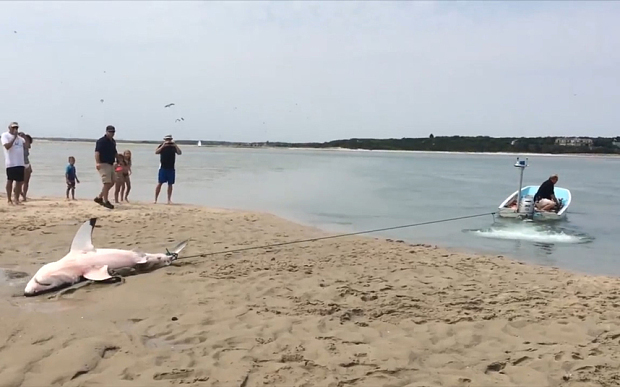 A juvenile great white beached itself while trying to catch seagulls off Chatham, Massachusetts. Thanks to the harbor master and beach-goers, this shark was saved. One shark's attempt to grab a quick bite landed him in serious trouble, as this great white became beached on Massachusetts' Cape Cod after attempting to catch seagulls. 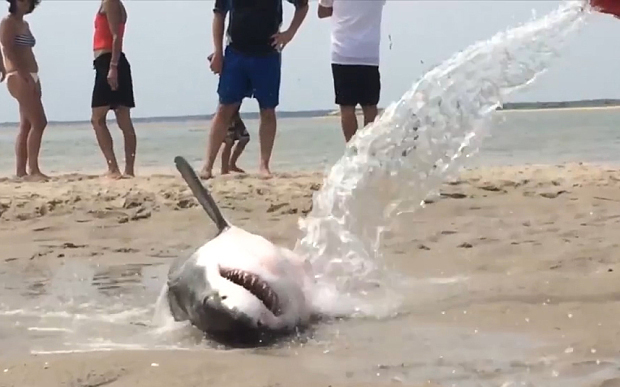 Beachgoers splashed the writhing predator with buckets of water in an attempt to keep the shark wet and cool before the local harbour master arrived on the scene. Harbour master Stuart Smith told the Associated Press that around 40 people were crowded around the shark when he arrived and it appeared dead. After nearly an hour and a half of being beached, the animal was dragged back into the sea and life returned to the young shark. It was promptly tagged with a GPS device and escorted to open waters, where it swam to freedom. Responses to "Great White Shark Rescued By Beachgoers (Video)"